When alleged 9/11 mastermind Khalid Sheikh Mohammed walks into his first court appearance Thursday in Guantanamo Bay, Cuba, it will launch the most high-profile test of a military court system that has been created, destroyed and rebuilt through nearly seven years of wrangling among the White House, Congress and the Supreme Court. Mohammed's long-awaited arraignment could begin to answer fundamental questions about the United States' handling of justice in the wake of the Sept. 11, 2001, terrorist attacks: Will the military commission system, which President Bush created to prosecute accused terrorists, ever hold one of them accountable for the tragedy? Or will the federal government's efforts to secure guilty verdicts crumble amid mounting concerns about the evidence, fairness to the defendants and treatment of the accused while in custody? And if guilty verdicts ultimately are rendered for Mohammed, four alleged co-conspirators and about 75 other Gitmo detainees facing prosecution, will those verdicts be widely viewed as valid? The answers could help determine whether the alternative justice system launched two months after the 9/11 attacks will prosecute alleged terrorists for years or even decades to come. Nearly seven years after the attacks â€” and after several revisions spurred by the Supreme Court and made by Congress â€” the system has not taken anyone to trial. Instead, it has been mired in criticism over whether it should allow the use of evidence obtained through harsh interrogation techniques â€” including waterboarding, which creates the sensation of drowning â€” for permitting evidence that can be withheld from defendants, and for holding closed court hearings without defendants or their lawyers. The Senate Judiciary Committee will meet Wednesday to scrutinize how the United States prosecutes alleged terrorists and to debate whether the system needs to be changed again. Critics and even several prominent onetime supporters of the system now say it is so deficient legally â€” and so flawed in the eyes of human rights groups and foreign governments such as the United Kingdom â€” that it should be abolished. If that happens, the United States will have to decide whether to hold the prisoners indefinitely without granting them trials or find another way to prosecute them. Military and legal specialists who study the commissions suggest four alternatives to the system at Guantanamo: using U.S. federal courts to hold trials, using the military courts-martial system, creating a new national security court or simply holding detainees until the undefined, open-ended "war on terror" ends. The analysts say each alternative highlights a perceived flaw in the military commission system that must be fixed for it to be credible. "It's dishonest to go through the charade and pretend we're doing something legitimate," says John Hutson, the dean of the Franklin Pierce Law Center in New Hampshire and a former Navy judge advocate who initially was an "ardent" supporter of the commissions. He believes the detainees deserve full trials in which they can see all the evidence against them. Military officials insist the commissions are the best way to balance the need for fair trials with the obligation to protect Americans from people they say are eager to kill U.S. soldiers and civilians. Even though terrorists don't abide by traditional rules of war, military officials say they get the same rights as traditional prisoners of war. "These courts, as constituted by Congress, meet and exceed all international standards," says retired Army major general John Altenburg, who oversaw the commissions from the Pentagon from 2004 to 2006. "We're too hung up on television programs and criminal justice as we know it in our own country. These people aren't entitled to that level of due process." Even as Mohammed's case moves forward, the commission system could be derailed. The Supreme Court, which has ruled against the Bush administration's detention policies three times since 2004, likely will rule soon on the latest challenge, which tests whether detainees have the right to protest their detention in U.S. courts. The court's decision could further delay hearings and force more changes. All three presidential candidates have vowed to close the Guantanamo prison, although none has provided details on a justice system or holding site that they believe should replace it. What's left is a cloud of uncertainty looming over the commissions and the prison that Amnesty International has dubbed the "gulag of our times." "If we had gotten some of these cases to trial, people would have seen what a fabulous system of justice the military system is," says Andrew McCarthy, who led the Justice Department's prosecution in the cases involving the 1993 World Trade Center bombing and consulted for the Pentagon on the military commissions. "Now you've got a perception problem, which I don't know that you can cure at this point." One alternative to the military commissions system is the federal courts, which would let detainees see the evidence against them. American courts generally require that defendants have access to all the evidence or witnesses who will be used at trial. Yet the Military Commissions Act passed by Congress in 2006 lets prosecutors introduce evidence against a detainee without sharing it if a judge believes doing so would compromise national security. Proponents of the regular U.S. courts say federal judges have shown they can handle sensitive issues. Federal prosecutors have convicted Zacarias Moussaoui for his role inplanning and training for the Sept. 11 attacks; Omar Abdel-Rahman, the blind Egyptian cleric convicted of assisting in a plot to bomb New York City landmarks; and others. Moussaoui pleaded guilty in 2005 to terrorism conspiracy charges. A jury convicted Abdel-Rahman in 1995 of seditious conspiracy and other charges. Both are serving life sentences. "The judges were able to come up with some provisions to deal with national security concerns," says Stacy Sullivan, an adviser on counterterrorism for Human Rights Watch who has observed hearings in Guantanamo. But Richard Samp, chief council for the Washington Legal Foundation, a conservative think tank, believes the evidence that federal judges allowed to become public during the trials hurt the war on terrorism. He says the cases tried in federal court â€” especially Moussaoui's â€” provided al-Qaeda with information about U.S. intelligence-gathering techniques. Some defense attorneys believe the commission system is weighted far too heavily in favor of the prosecution and cloaks mistreatment and neglect of detainees. Air Force Maj. David Frakt has asked that a psychologist examine Mohammed Jawad, a detainee he is defending who is charged with throwing a grenade at U.S. troops in Afghanistan in 2002. It wasn't until last week, Frakt says, that he was informed Jawad tried to commit suicide by hanging himself in his cell more than four years ago. He says the failure to disclose that speaks volumes about detainees' ability to get a fair trial. Altenburg, who oversaw the commissions, says there has been no coordinated effort to withhold information. He says delays result from trying to prosecute alleged war criminals during a war, forcing intelligence officials to hand over evidence that is being used in the battlefield. Some analysts ask why the military didn't use its courts-martial system. Hutson, the Franklin Pierce Law Center dean, says the proven, well-respected process could protect national security while ensuring fair trials. Like the federal courts, this option would require that defendants and their lawyers see all the evidence against them. Yet members of the military would remain as judge and jury, which would do little to alleviate the chorus of opposition against Guantanamo, says McCarthy, the former federal prosecutor. McCarthy says there should be a clean break from the military-judge system to help the United States regain international trust. "The appearance of integrity is important in this war," he says. "Unless we have a system that has and exudes integrity, we're hurting our security." He favors a third option for handling detainees: a new court that largely follows the military commission model but inserts a federal judge atop the proceedings. A national security court could combine the neutrality of federal judges with the security safeguards in the military commissions. Altenburg calls such a terrorism court a "reasonable alternative" but says there's no point in setting up an entirely new system now. "They're going to have the same hitches that the military suffered" when establishing the commissions, he says. A fourth option is to treat the detainees as the United States has treated past prisoners of war: hold them until the government's "war on terror" is over â€” whenever that may be. Timothy Lynch, director of the Cato Institute's Project on Criminal Justice, supports military commissions. But if enough pressure builds to abandon them, he thinks America should detain the most dangerous detainees until the war ends â€” a political determination, he says, to be made by a future president in consultation with Congress. About 120 of the 270 detainees in Guantanamo are being held without the prospect of a trial, according to the Pentagon. "In our past wars, we've held many prisoners in POW-style camps. We can do the same thing in this war," Lynch says. Human rights activists believe such indefinite detention is inhumane, because it is unclear how or when the war on terror will end. "Is it the war in Afghanistan? Is it the war in Iraq? It's an indefinite war. A war with no time frames," says Jamil Dakwar, director of the Human Rights Program for the American Civil Liberties Union. "All of this is going to create a humanitarian crisis and will only increase the problems the government is facing in the future." The alternatives are beginning to receive more scrutiny on Capitol Hill and among military specialists. Yet no quick consensus is emerging. The fate of the Guantanamo detainees likely will be decided by the next president. "There is a desire on the part of some defense counsel to delay proceedings until the next administration, in hopes that fairer procedures will be put into place," says Frakt, the defense attorney. "At the same time, every day that we delay is another day that our clients spend in misery in Guantanamo." GUANTANAMO BAYâ€“At a tightly-choreographed court appearance that has been months in the planning, the world will get its first glimpse Thursday of the five men the Pentagon claims were responsible for the 9/11 attacks. Sixty hand-picked American and foreign journalists who were flown from Washington to this U.S. navy base have quickly transformed a cavernous hangar here into an international newsroom. Although no cameras will be allowed in the courtroom, television reporters are set to send live broadcasts detailing what some describe as the most important military trials in modern history. The Bush administration needs the hearing to go according to script in an attempt to rescue Guantanamo's bruised reputation. There were rehearsals and mock trials in recent months so courtroom staff could prepare for Thursday, while construction on a $12 million tent city known as "Camp Justice" was completed to accommodate all the visitors. But if past hearings for other detainees are any indication, officials are undoubtedly bracing for problems. Since the war crimes hearings began in late 2006, court appearances have at times been a comedy of errors. Inaccurate translations, a faulty sound system, or even a power failure that killed the lights and sent soldiers scrambling to surround the detainee and judge, have made it hard to compare these historic trials to the last U.S. war crimes trials held in Nuremberg at the end of World War II. And controversy has already surfaced this week, when family members of the 9/11 victims issued a letter protesting the invitation of only one relative to the hearing. "As people who lost loved ones in the terrorist attacks of 9/11, we want nothing more than to see that justice is served in the prosecution of suspects. However, we know that no justice will come out of a system that has been compromised by politics and stripped of the rule of law," seven family members wrote. "Selectively inviting only 9/11 family members whose views are in alignment with those of the Bush administration is only one example of the repeated attempts to infuse politics into what should be an impartial process that has the goal of achieving justice." U.S. Air Force Brigadier General Thomas Hartmann acknowledged the mistake during a press conference here Wednesday night and said there are no relatives here as planned. "It shouldn't have been done that way. It should have been done more comprehensively, more completely, more thoroughly and in the future we will have a lottery system to make sure the victim's family have equal access," said the senior Guantanamo legal advisor. Appearing Thursday morning will be five of the so-called "high-value detainees" who are considered the most senior members of Al Qaeda now in custody. They include Khalid Sheikh Mohammed, the reputed 9/11 mastermind who is often referred to as KSM. Unlike other detainees here such as Canadian Omar Khadr, who was 15 when he was shot and captured after allegedly fatally wounding a U.S. soldier, these five men are the first to be accused of direct involvement in planning the September 11 attacks that killed 2,973. They are also among the detainees who were taken to secret CIA facilities before U.S. President George W. Bush ordered the spy agency to transfer them here. CIA director Gen. Michael V. Hayden has already publicly confirmed that Mohammed was one of the suspects who the agency waterboarded â€” a technique whereby interrogators simulate a drowning. Despite their secret detention and harsh treatment, the five terrorism suspects are unlikely to elicit the same type of international sympathy that many of the remaining 270 prisoners here have generated. The Pentagon is pushing to have their trial start in September. Critics say the timing is no coincidence, as it would fall weeks before the U.S. presidential election. "A trial of this historic importance should be shielded from any hint of election-year politics," said Joanne Mariner, Human Rights Watch's terrorism and counterterrorism director in a statement Wednesday. "Unfortunately the military commissions at Guantanamo have none of the independence of U.S. federal courts, leaving them vulnerable to political influence." GUANTANAMO BAY NAVAL BASE, Cuba (AP) â€” Almost seven years after terrorists hijacked airliners and used them as missiles to kill 2,973 people, five men who allegedly plotted the attacks face a military tribunal Thursday. Khalid Sheikh Mohammed, the confessed mastermind of the Sept. 11 attacks, will be arraigned simultaneously with four other detainees inside a high-security courthouse at the remote U.S. Navy base in Guantanamo Bay, Cuba. Mohammed boasted of numerous attacks and plots against the United States in a closed military hearing last year, and the al-Qaida kingpin and his confederates will be given the chance to speak out again in their war crimes trial, according to a top tribunal official, Air Force Brig. Gen. Tom Hartmann. "In the course of trial they'll have opportunity to present their case, any way they want to present it subject to rules and procedures," Hartmann told The Associated Press. "That's a great freedom and a great protection we are providing to them. We think ... it is the American way." The arraignment will launch the highest-profile test yet of a tribunal system that faces an uncertain future. The U.S. Supreme Court struck down an earlier system as unconstitutional in 2006, and is to rule this month on the rights of Guantanamo prisoners, potentially delaying or halting the proceedings. And with less than eight months remaining in U.S. President George W. Bush's term, presidential candidates Barack Obama and John McCain both say they want to close the military's offshore detention center. Dozens of U.S. and international journalists arrived at Guantanamo on Wednesday on a military plane from Andrews Air Force Base outside Washington, joining prosecutors, defense attorneys and observers who arrived earlier at the Navy base. Mohammed and the four alleged coconspirators all face possible death sentences. They are expected to be seated Thursday morning at separate defense tables aligned in a row inside the prefab courthouse. Many of the participants and observers will stay nearby in tents erected on an abandoned airport runway as part of the "expeditionary" legal complex. Family members of those killed on Sept. 11, 2001, wanted to attend, but the military said it was too difficult logistically to accommodate dozens more people. Instead, the military is planning to show the trial but not the arraignment on closed-circuit television to victims' families gathered on U.S. military bases. "For transparency and to add legitimacy to the trial, they should have the loved ones there," said Dominic J. Puopolo, whose mother Sonia Morales Puopolo was a passenger on American Airlines Flight 11, the first jet that crashed into the World Trade Center. Puopolo said he also wanted to see the defendants, especially Mohammed, who claimed he personally proposed the plot to Osama bin Laden. "This is an architect of such pure evil," Puopolo told AP. "I want to see him eye to eye." Even without televised coverage of his arraignment â€” Mohammed's first public appearance since his capture in 2003 â€” the U.S. is taking a security risk by giving him an opportunity to spread al-Qaida propaganda, said Benedetta Berti, a research fellow at Tufts University's Jebsen Center for Counter-Terrorism Studies. "This is a very educated man," she said. "It is a risk because he could attack the U.S. in terms of international opinion and his audience is not just the international community, it is more specifically potential jihadists." The tribunals, which Congress and the Bush administration resurrected after the 2006 Supreme Court ruling, have been mired in confusion over courtroom rules and dogged by delays. No detainee has been tried yet, although David Hicks was convicted through a plea bargain and allowed to serve a nine-month sentence in Australia. Critics say men accused of such horrific crimes must be brought to justice, but in a way that shows the world that the U.S. has treated them fairly. "While everyone seems to recognize that the time to bring those responsible for 9/11 to justice is long overdue, this needs to be done in a system that has credibility," said Jennifer Daskal of Human Rights Watch. Hartmann insisted the trials will be fair even though the evidence may include coerced statements and material so classified that even the defendants can't see it or challenge it. Hartmann also sought to draw a distinction between the tribunals and the sometimes brutal U.S. detention and interrogation practices that have been condemned around the world. "We are not Guantanamo, we are not Camp X-Ray, we are not Abu Ghraib," he said, referring to notorious holding centers at Guantanamo and Iraq. "We are the military commissions, uniformed officers on the prosecution and the defense, with established court procedures." Attorney General Michael Mukasey also said Wednesday that the tribunals will be "in the best traditions of the American legal system" even though the military judges can consider hearsay evidence and confessions obtained through coercion, which aren't admissible in civilian courts. "Different situations call for different solutions," he said. The four defendants due to appear with Mohammed are: Ramzi Binalshibh, said to have been the main intermediary between the hijackers and al-Qaida leaders; Ali Abd al-Aziz Ali, known as Ammar al-Baluchi, a nephew and lieutenant of Khalid Sheikh Mohammed; al-Baluchi's assistant, Mustafa Ahmad al-Hawsawi; and Waleed bin Attash, a detainee known as Khallad, who allegedly selected and trained some of the 19 hijackers. Florida - Sally Regenhard still sobs at the thought of the price her son Christian, a New York firefighter, paid trying to save those inside the World Trade Center on Sept. 11, 2001. I feel that the 9/11 families have had no justice, no accountability, no responsibility from anyone -- from either terrorists or local people in New York City who failed this city to national governmental agencies that failed the American people, she says. On Thursday, a new chapter opens for Regenhard and other family members of 9/11 victims who have been seeking justice for their loved ones: Alleged al Qaeda kingpin Khalid Sheik Mohammed and four others will formally be arraigned as co-conspirators at a military commission in distant Guantanamo Bay, Cuba. "There's no closure for parents. Ever. At least we'll get an idea of what a modicum of justice looks likes, seems like, tastes like," Regenhard said from her home in the Bronx. "There's a thirst for justice." No homogenous group, the families left scarred by Sept. 11 include the tens of thousands of spouses, orphans and parents of the 2,973 adults and children killed that day. Add the survivors, those who escaped injured, both physically and emotionally, and their number is too vast to quantify. They include people like Alice Hoagland, whose son Mark Bingham fought the hijackers of United 93, bringing it down in a Pennsylvania field rather than perhaps on Pennsylvania Avenue. She welcomes the trial at Guantanamo of Mohammed, who allegedly confessed in CIA custody, "and I do hope that he is found guilty," she said. "I'd like to see him justly punished . . . for his ugly crimes every day of his life." And they include the children whose parents perished at the World Trade Center and who are still grieving, says Candy Cucharo, director of programs at Tuesday's Children, a nonprofit family service organization founded by family and friends of 9/11 victims. This is going to be a trauma trigger for them," said Cucharo, who works with the orphans of 9/11. "For many kids, this is going to be a very traumatic event, reading it in the media, seeing it on television it's going to bring them back to their loss." Thursday's arraignment is the first public appearance of the alleged organizers, financiers and trainers of the 19 hijackers, among them Mohammed -- the man called KSM who has reportedly bragged to U.S. military officers that he masterminded "from A to Z" the mass murder by airplane hijacking. No one knows what he will do when he is led before a Marine Corps judge. He and his alleged co-conspirators have been shielded from the public since their capture across the globe in 2003 -- and subsequent secret overseas CIA custody, which included waterboarding Mohammed into confessing. But the arraignment will surely thrust that dark day back into the headlines. The Pentagon planned to airlift dozens of media from Washington to the remote U.S. Navy base, where an arraignment typically includes a formal reading of the charges. These charges include the names of all 2,973 victims. With no provision for photography or Court TV style coverage, journalists being brought to the base on the eve of the Thursday arraignment will be left to describe what they see and hear. No family members will be in attendance. The Defense Department was still developing a lottery system to choose observers from among the Sept. 11 families and considering a secured closed-circuit feed to U.S. military bases in the United States. Some regret that the trials will be held offshore, in far away Guantanamo, to be tried by U.S. military officers, not at the federal court in Manhattan, where other alleged terrorists have been tried and convicted. Others say they don't want to put New York at risk, or through the pain, by bringing the alleged senior al Qaeda terrorists there. Deputy Fire Chief Jim Riches, who led search and rescue operations at Ground Zero, personally carried his 29-year-old firefighter son's remains from the rubble. Now he wants America to see the trial and the evidence and know what was done. "They committed the crime in New York, where these people died, the murders occurred," he said. "They're making a commission on a military base. Well, I would like to see it at Fort Hamilton in Brooklyn, where I live." So what, he said, if Mohammed boasted of what he did and later, in Pakistan, beheaded Wall Street Journal correspondent Daniel Pearl "with my blessed hand." "Taunting America will be their final act," Riches said. "Let's see how strong they are when they put that rope around their necks. I would pull the trigger. Or push the button. Or inject them and look right in their eyes -- if these guys are guilty. 'I would tell him, 'There's no 90 virgins up there buddy. You're going down to see Satan.' "
The alleged mastermind of the 9/11 attacks on the US is to appear at a military tribunal at Guantanamo Bay. It will be Khalid Sheikh Mohammed's first time in public since he was captured in Pakistan in 2003. Prosecutors are seeking the death penalty against him and four others also accused of plotting the attacks. The BBC's Jonathan Beale - one of 60 journalists attending the trial - says the hearings raise questions about the legitimacy of US military commissions. The US describes Khalid Sheikh Mohammed, believed to have been al-Qaeda's third in command, as "one of history's most infamous terrorists". Following his arrest he was held at a CIA secret prison, where he was subjected to harsh interrogation techniques and a practice known as waterboarding, that simulates drowning, until he was moved to Guantanamo Bay two years ago. US military say that as well as admitting involvement in the 11 September 2001 attacks on Washington and New York, he has confessed to being involved in more than 30 terrorist plots around the world, including plans to attack London's Big Ben and Canary Wharf. He is among five so called "high value detainees" accused of plotting and aiding the 9/11 attacks who will appear before a military judge in a courthouse built inside the US detention facility on Cuba. The charges against them list "169 overt acts allegedly committed by the defendants in furtherance of the September 11 events". The charges, which include 2,973 individual counts of murder - one for each person killed in the 9/11 attacks - are the first directly related to the 9/11 attacks to be brought against any Guantanamo inmates. The five are among 19 prisoners due to face the military tribunals, which were set up in the wake of 9/11 to try non-American prisoners who have been classed as "enemy combatants" by the White House and therefore deemed to not be entitled to the legal rights normally afforded to prisoners. The trials have already raised questions about not just the treatment of detainees, but also the legitimacy of American military commissions. Our correspondent says these trials will be as much a test case as a showcase of military justice. The US authorities say they have bent over backwards to make sure that the trials are fair but some of its own lawyers have already condemned the process as fundamentally flawed. US air force Brigadier General Tom Hartmann told the Associated Press news agency that the tribunals would allow the detainees the chance of a proper hearing. "In the course of trial they'll have opportunity to present their case, any way they want to present it, subject to rules and procedures," he said. "That's a great freedom and a great protection we are providing to them. We think... it is the American way." "We are not Guantanamo, we are not Camp X-Ray, we are not Abu Ghraib," Brig Gen Hartmann added. "We are the military commissions, uniformed officers on the prosecution and the defence, with established court procedures." Human Rights Watch, a New York-based organisation, has said that the system lacks credibility. "Possibly putting someone to death based on evidence obtained through water-boarding, or after prolonged periods of sleep deprivation while being forced into painful stress positions, is not the answer," said Jennifer Daskal, a lawyer for the group. Later this month the US Supreme Court is to rule on the rights of prisoners being held at Guantanamo Bay, threatening a possible delay or even halt to the proceedings. The court ruled in 2006 that an earlier tribunal system was unconstitutional. Relatives of those killed on 11 September had wanted to attend the trial, but the military decided that it could not accommodate them at Guantanamo Bay. Much of the complex built for the trial, known as Camp Justice, consists of tents erected on an abandoned runway at the base. Instead family members will be able to watch the proceedings at other US military bases via closed circuit TV. Sixty US and international journalists have flown to Guantanamo Bay to witness the opening of the trial. GUANTANAMO BAY NAVAL BASE, Cuba (AP) â€” The military expects a confrontational hearing when the alleged mastermind of the Sept. 11 terrorist attacks and four alleged confederates are brought before a Marine colonel presiding over their war-crimes tribunal. Army Col. Steve David, chief defense counsel for the tribunals, said the military commissions â€” which the U.S. Supreme Court struck down in 2006 as unconstitutional before they were altered and resurrected months later â€” are "fundamentally flawed." "We will zealously identify and expose each and every" flaw, he said. The tribunals have been mired in confusion over courtroom rules and dogged by delays. Military commissions have been conducted since George Washington used them after the end of the Revolutionary War, but this is the first time the United States has used them during an ongoing conflict, Hartmann said. Mohammed is represented by two officers from the Navy and the Air Force. Two civilian attorneys from Idaho, including one who defended a client accused in the white supremacist Ruby Ridge case, also represent the Pakistani. Defense attorneys for the five detainees accused in the Sept. 11 attack that killed 2,973 people say the U.S. is rushing the case to trial to influence the presidential election. They recently asked Kohlmann to throw out the case and remove Hartmann, who was accused of political meddling by a former chief prosecutor for the military commissions. Two weeks ago, Deputy Secretary of State Gordon England declared that providing "fair trials" at Guantanamo is the No. 1 legal services obligation for the Defense Department, said Hartmann, the legal adviser to the tribunals. He said he has not been asked to recuse himself from the upcoming trial. Mohammed will be arraigned simultaneously with the four men inside the high-tech courthouse, part of the "expeditionary legal complex" arrayed on an abandoned airfield at Guantanamo. Guards will be near the men but no firearms are allowed in the courtroom, said Army Col. Wendy Kelly. Mohammed and the other four detainees can be restrained by retractable leg chains hidden underneath the raised courtroom floor if they become unruly, Kelly said. The arraignment will launch the highest-profile test yet of a tribunal system that faces an uncertain future. The U.S. Supreme Court struck down an earlier system as unconstitutional in 2006, and is to rule this month on the rights of Guantanamo prisoners, potentially delaying or halting the proceedings. And with less than eight months remaining in President Bush's term, candidates Barack Obama and John McCain both say they want to close the military's offshore detention center. Obama opposed the Military Commissions Act that in 2006 resurrected the military commissions, but McCain supported it. The modular courtroom can be taken down and "sent to Fort Bragg, Fort Lewis, or any installation that needs a big courtroom," Kelly said. Dozens of U.S. and international journalists arrived at Guantanamo on Wednesday on a military plane for the joint arraignment, which the military expects to last just one day. The five prisoners will be formally notified of the nature of the charges, will be told of their rights to attorneys and will be given the opportunity to enter a plea, though they do not have to enter one, Hartmann said. All five are charged with murder in violation of the law of war, conspiracy, attacking civilians, terrorism and other crimes. "Out of good intentions, one of them was invited. It shouldn't have been done that way, it should have been done more comprehensively, more completely, more thoroughly," Hartmann told dozens of journalists who were flown to Guantanamo to observe Thursday's hearing. "In the future, we will have a lottery system to make sure the victim families have equal access, equal opportunity to come, to visit, to see the hearings, any parts of the hearings that they like ... and we will be consistent in our practices from now on." Accused September 11 mastermind Khalid Sheikh Mohammed and four other prisoners -- Ali Abdul Aziz Ali, Ramzi Binalshibh, Mustafa Ahmed al-Hawsawi and Walid bin Attash -- are to appear before a judge at the remote naval base for the first time on charges of conspiring with al Qaeda to murder civilians. They are also charged with 2,973 counts of murder, one for each person killed in 2001 when hijacked passenger planes slammed into the World Trade Center, the Pentagon and a Pennsylvania field. The suspects, who could be executed if convicted, were transferred to Guantanamo in September 2006 after spending about three years in secret CIA prisons. They are among 19 prisoners now facing charges in the tribunals established after the September 11 attacks to try non-American captives whom the Bush administrations considers unlawful "enemy combatants" not entitled to the legal protections granted to soldiers and civilians. The tribunals first convened in August 2004 and pretrial hearings have plodded along amid numerous and often successful legal challenges from military defense lawyers who call the process unfair and rigged to convict. One case was resolved when an Australian prisoner pleaded guilty via negotiations that cut his sentence to nine months in prison, but no case has advanced to trial. The Pentagon approved charges in May for the five accused September 11 plotters, who are the first Guantanamo prisoners accused of direct involvement in the attacks that launched the Bush administration's war on terrorism. The military lawyers assigned to defend them have only recently met them and have accused the government of trying to rush the cases to trial in order to influence the November U.S. presidential election. While no one group can speak for all of the families of those killed, seven women who lost husbands and sons in the attacks echoed those accusations in a letter sent on Wednesday to the Pentagon official overseeing the trials, Susan Crawford. 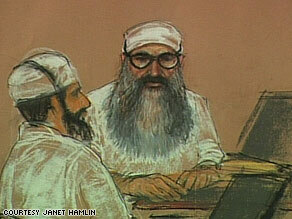 Khalid Sheikh Mohammed stands before a military judge Thursday in Guantanamo Bay, Cuba. WASHINGTON (CNN) -- Alleged 9/11 mastermind Khalid Sheikh Mohammed told a military court judge Thursday that he wishes to plead guilty to charges in connection with his role in the attack and become a martyr. Mohammed told the judge, Marine Col. Ralph Kohlmann, that he wants to represent himself. Kohlmann asked Mohammed numerous times if he understood that he faces the death penalty, and Mohammed at one point said, "That is what I wish. I wish to be martyred." He told the judge he could not accept any attorney because he only believes in Sharia, or Islamic law. Mohammed and his four co-defendants, all suspected al Qaeda figures, are being arraigned on numerous charges for their alleged roles in the September 11, 2001, terror attacks on New York and Washington, which killed nearly 3,000 people. It is the first time that reporters have been able to see the accused al Qaeda operatives, who were all in the same room for the first time since their arrests in 2002 and 2003. The defendants were seated at separate tables. None stood when Kohlmann entered. They spoke freely among themselves throughout the proceeding, and Mohammed appeared to be instructing the others. Ramzi bin al-Shibh, who is accused of helping coordinate the attacks, was the only defendant in leg shackles. He entered the courtroom with a defiant swagger, laughing at media members who were straining to get a look at him. In addition to Mohammed and bin al-Shibh, the defendants are Walid bin Attash, who is said to have helped train the hijackers; and Mustafa al Hawsawi and Ali Abdul Aziz Ali, both of whom are accused of arranging financing for the plot. Attash also told the judge he wanted to dismiss his legal team and represent himself. Wearing a prison outfit and a foot-long gray beard, Mohammed appeared much thinner than when he was captured five years ago. When he was addressed by Kohlmann, he started singing a prayer in Arabic and then repeated it in English. The judge stopped him, saying, "I understand you have been held here for a long time and have some things to say." Mohammed asked to continue what he was saying, noting that he understood he could not talk about torture or the Quran. Kohlmann allowed it, and Mohammed started to talk about wishing to represent himself. Mohammed's lawyer interjected, saying his client did not understand the importance of the arraignment, and the judge explained to Mohammed that it would not be a good idea to represent himself. Kohlmann announced at the start of the session that at least part of the detainees' statements would be classified and the judge would block out audio. The defendants have been in U.S. government custody since 2002 and 2003, and they were transferred to the U.S. military prison at Guantanamo Bay in September 2006. The charges against them include murder in violation of the law of war, various terrorism counts and intentionally causing bodily injury. In a written statement read at a March 2007 hearing, at which he was present, Mohammed said he was responsible for the attacks "from A to Z." Although Thursday's proceedings may not be complex, they follow years of struggles by the Bush administration to craft a process for bringing the detainees to trial, and officials involved in the military commissions know that the eyes of the world will be on them. Critics have called Guantanamo Bay a legal "black hole" for detainees who the United States says are not protected as prisoners of war under the Geneva Conventions. Defense attorneys had asked for Thursday's proceedings to be delayed, arguing that they have not had enough time with their clients since the charges were announced in May. Army Maj. Jon Jackson, al Hawsawi's lawyer, said that it's a good thing the cases are finally moving forward but that defense attorneys should have more time to discuss the cases with their clients. "We, the defense, should have been granted a reasonable delay in order to develop a relationship with these men, to talk with them about their case, to discuss strategies before we are rushed into the courtroom," Jackson said before heading to Guantanamo Bay. Kohlmann denied the delay request. Defense lawyers also have accused senior Pentagon officials of pushing the cases forward "in order to influence the November elections," as Lt. Cmdr. Brian Mizer, who is defending Ali, put it last week. But officials at the Office of Military Commissions, the Pentagon unit that serves as the convening authority for the tribunal, deny that assertion and argue that defense lawyers will be given enough time to mount their cases. "The fact they are just starting in that process isn't an indication they won't have time to prepare," said Air Force Brig. Gen. Thomas Hartmann, the legal adviser to the office. The actual charges against the men were only sworn against them May 9. And although prosecutors are pushing for a September trial, officials familiar with the process expect long delays and much legal fighting. They say a trial is probably at least many months away. Another controversy concerns whether prosecutors will introduce information obtained as a result of coercive interrogation techniques used by the CIA, techniques critics say amount to torture.